Saxophonist with a long career that had him only briefly in the spotlight as a main performer, but with a monumentally important role in the process when it came to spreading the gospel of rock ‘n’ roll. 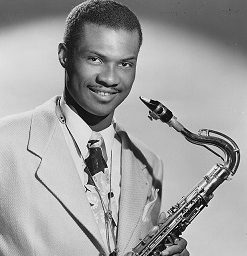 Moore was born in 1918 and began playing alto sax before switching to tenor, inspired like most of his generation by the wild displays by Illinois Jacquet. Settling into a role as a sessionist, Moore played behind Big Maybelle on her debut side in 1944 with Christine Chatman’s group, and also was one of many ad hoc groups that backed Big Joe Turner in his wilderness years, but he notched his most impressive credit during this period on the huge 1945 Helen Humes hit, “Be-Baba-Leba” with Bill Doggett’s outfit. Signing with Savoy in 1947 his first sides came and went without notice when he was enlisted to cut some sides with baritone sax player Paul Williams, who’d first scored with rock instrumentals that fall. The two horn players worked well in unison and alternated credit on their releases for the next few months, though both were equally prominent on the records. Though not first among the rock sax stars, Moore’s records were the ones to firmly connect the music with the term itself, using “rock” in multiple titles over the next few years, including after he switched to Modern Records in 1949, all of which helped to ensure the name of the style was widely known. Unlike Williams who became a prominent bandleader on multi-artist rock tours in the 1950’s, Moore faded into the background again, cutting some good, but little heard sides for Sensation, Regal, King and Old Town, but like many former honking rock sax stars when the music began featuring more prominent guitar breaks as opposed to sax he drifted back into jazz before getting one final glorious reprieve when the longtime Detroit resident was asked by Marvin Gaye to play on his immortal What’s Goin’ On album, as Moore contributed the key part in “Mercy Mercy Me (The Ecology)”. He remained active on stage until the very end, dying in California in 1983 at the age of 65. As sideman… for Paul Williams.